Allow a trusted Technician to add a printer to the print infrastructure. After reading your email invite (on a phone) the Technician can proceed to add printers. The invite is valid for 72 hours. If you have multiple networks you should be aware that Technicians can add printers only to Network1 (the first network). Select Do not add printer automatically (default) or Add automatically. Optional Name of the Technician. Optional Printer name and Location texts for one or More printers. If the email does not arrive within a few minutes then ask the technician to check the spam/junk mail folder. On the Users page the technician is listed with the role Technician (cannot be changed). Once the technician has successfully installed the printer, administrators can choose to add the printer on their computer and test printing. Select this to not activate the printer right away. This will allow administrators (you) to test printing before deciding to make the printer active. When you are satisfied with the printing (and choice of print driver), you can open the Print queue properties page and check Active. As always, you should ensure that the printer IP address is static. 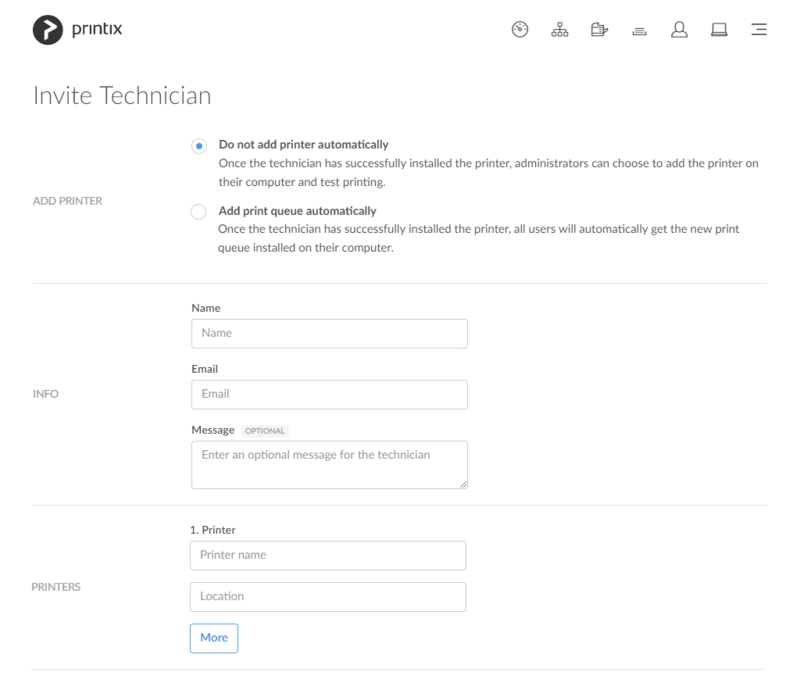 Once the technician has successfully installed the printer, all users will automatically get the new print queue installed on their computer. Use this if the new printer is compatible with one or more printers that are already part of the print infrastructure. As always, you should ensure that the printer IP address is static. Enter the Name of the Technician. If you do not enter anything the user is called Technician. Enter the Email of the Technician. This is required. Optional message where you can write how to get hold of you and any additional instructions regarding the printers. Enter a printer name to match your existing printer naming convention. When users see the printer name it will always include the three-letter printer ID. Enter a location text that is meaningful to users. Select More if the Technician is to add more than one printer. More only works if you have specified both Printer name and Location of the first (previous) printer.